Now the Philistines fought against Israel; the Israelites fell before them and many fell dead on Mount Gilboa. The Philistines were in hot pursuit of Saul and his sons, and they killed his sons Jonathan, Abinadab, and Malkishua. The fighting grew fierce around Saul and when the archers overtook him, they wounded him critically. Saul said to his armor-bearer, “Draw your sword and run me through or these uncircumcised fellows will come and run me through and abuse me.” But his armor-bearer was terrified and would not do it; so Saul took his own sword and fell on it. When the armor-bearer saw that Saul was dead, he too fell on his sword and died with him. So Saul and his three sons and his armor-bearer and all his men died together that same day. What an inglorious end to an otherwise very promising king with incredible potential! What shall it profit a man if he gains the whole world but loses his own soul? What shall it profit a man if he gains all the power in the world but ends up committing suicide and having his body impaled by his enemies on a wall? It is important to finish well. Saul started out as a very promising king. He had everything going for him. Saul was handpicked by God as the first king of Israel. He was ratified through a public lot directed by God’s prophet, Samuel. Samuel wrote down all the laws that pertained to the kingship. Saul was given divine guidance about how to rule God’s people. Saul was set up for success. But, somehow, Saul put himself on a path of disobedience to God. He disobeyed God by sparing the king of the Amalekites and taking spoils of choice cattle for himself when God had specifically instructed him to annihilate everyone and everything. He set up monuments to honor himself whilst he dishonored God through disobedience. He also crossed a sacred line by offering a sacrifice, a duty reserved by God only for the priest. Saul had no fear of the divine. He killed eighty-five priests and every living person including women, children and animals in the town of Nob where the priests resided. Saul was consumed with the desire to kill David. He spent vast resources pursuing David from town to town with three thousand soldiers. He almost killed his son Jonathan for shielding David. His whole kingship was fixated on eliminating David and entrenching himself in power. God took his hands off Saul and gave the kingship to David. The end of Saul was dismal. Godlessness and disobedience never pay off. It leads to nothing but death! Scripture is clear: “There is a way which seems right to a man but the end of it is death. “ (Proverbs 14:12). Would you be authentic in your walk with God and walk in obedience to Him? You will never regret choosing the path of righteousness and obedience. 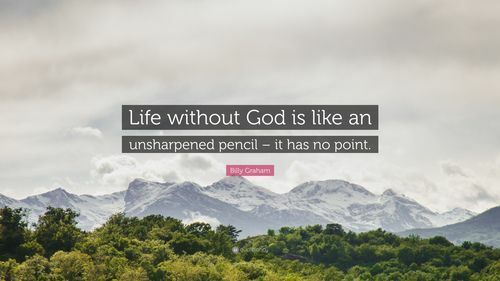 Life without God is a hopeless end! Prayer: Lord, I thank you for the privilege you have given me as your disciple. Please help me to walk the straight and narrow way to please you at all times. Amen.